Paint the study in Railings. Not study how to paint the railings! I despair at the ignorance of Mr Clarke when it comes to interior design. I innocently assumed that everyone knew the Farrow & Ball colours as intimately as I do. Seemingly not. The reason I had asked my husband to paint the study is because we are coming to the end of full blown house renovation. I have been spending the last year knocking down and putting back together Garden Rose Cottage, a Grade II listed property in the middle of the Warwickshire countryside. The first three months was planning and paper work, then came the builders, re-wiring, plumbing, plastering, banging and making of copious amounts of tea during the management of the build. Kevin McCloud would have quivered in his boots to watch me whip the team of ten workmen into shape over the last few months. The dust has now settled and Garden Rose Cottage is almost ready to call home. But a house is not a home until the curtains are up, the cushions are laid on the sofa and the walls are adorned with Farrow & Ball. That is the gospel according to Mrs Clarke. Although I see myself as the font of all interior design knowledge (I have a subscription to Living Etc AND Elle Decoration after all!) I thought it would be a wise move to invite the lovely colour consultant from the Leamington Farrow & Ball showroom to visit and discuss my ideas. The difference it has made is huge. Claire’s expertise was worth it’s weight in gold (or Yellow Ground). There was a pre-appointment phone call to run through what our property is like and how many rooms I wanted painting. Claire then headed across with mood boards, samples and lots of knowledge. The advice and inspiration I was provided with was just what I needed to create perfect rooms for different uses. Let’s just slap on some white paint and move in, was Mr Clarke’s retort when he found out that we would be having a boutique paint advisor visit. I’ll slap you with some white paint dear if you use Farrow & Ball’s name in vain again. Claire was the consummate professional; she was knowledgeable, able to advise on colours, finish and she pushed my boundaries and got me thinking about light, mood and lifestyle. She was an Elephants’ Breath of fresh air. The room that I was delighted with the most was the study. We didn’t go for Railings in the end, Claire convinced me to be dark and paint everything Off Black. 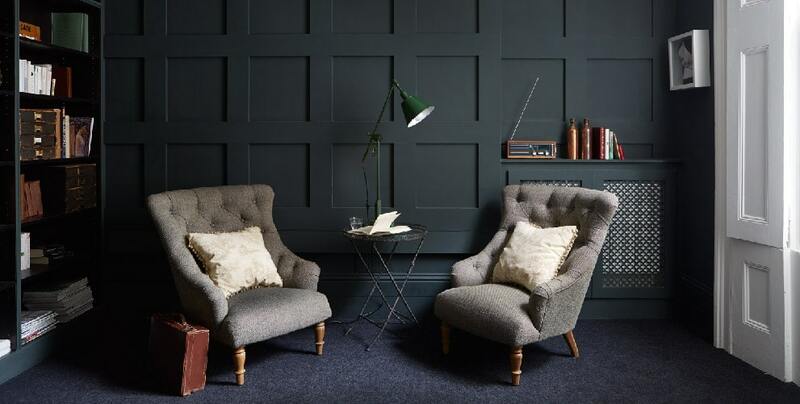 My initial reservations were that it would look like a smelly night club with the lights on, but my private colour guru thinks that by painting the skirting boards, walls and ceiling in the moody shade will create a room with real interest and character. I can’t wait for it to be done and I’m already hunting for the perfect desk, arm chair and book case for somewhere to kick Mr Clarke into. Lucky boy! For the small outlay, Claire created a thorough project plan with everything the decorators needed. There was even a £50 voucher to put towards the paint. Claire even managed to charm Mr Clarke when he popped into the shop by saying his mustard cords were very Farrow & Ball. Now that is good service. Have a look at our Instagram and Pintrest boards for paining ideas and inspiration. To book an appointment with Farrow & Ball call 01926 424 760 and say Mrs Clarke sent you.